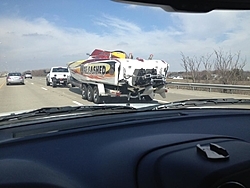 [ATTACH=CONFIG]520511[/ATTACH]"Unleashed" Cig Gladiator was rolling west on I-74 outside of Bloomington, IL. You could spot the #5's stagger setup a mile away. Last edited by dykstra; 03-19-2014 at 07:38 AM. I wonder if it was heading to Pier 57? #5 or #6 whatever it takes. It's all ball bearings these days. You work over this way, Dykstra? Has to be a magic carpet with 750's - Im sure its a fun boat!